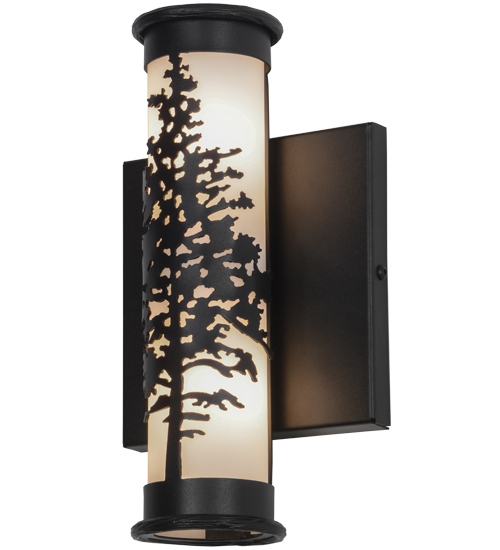 Description: A tall Tamarack Pine tree adorns this handsome cylindrical lantern while beautiful ambient light is achieved through a clean Statuario Idalight diffuser. Designed in the Arts and Crafts tradition, the wall fixture is featured in a striking Black finish. Handmade in the USA at the foothills of the Adirondacks. Tamarack wood is used for house frames, toboggans, canoes, railroad ties, fence posts and even food and tea that heals ailments.